Dental implants are fast becoming the first choice for both dentists and patients alike when it comes to replacing missing teeth, and that’s true at Ridgepointe Dental as well. With dental implants, small titanium screws are placed directly into the jawbone in order to simulate the root structure of lost teeth. These can then be attached to dental prosthetics that can restore any number of teeth, providing a secure, durable, and natural-looking result. Whether you are missing a single tooth or an entire row, they are simply the best way for you to get your smile back. After having an implant post placed by a specialist, we will attach a ceramic crown to a metal abutment, which is a small metal screw that will connect it directly to the implant post, or directly to the implant itself. 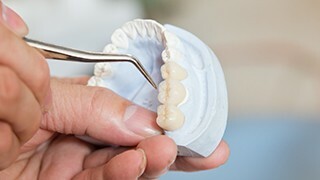 If you have multiple missing teeth in a row, two of these crowns can be placed on either side of the gap in your smile, and then they can be connected to a prosthetic tooth to completely fill in space, forming a bridge. Do you have a denture that constantly slips and slides out of place? 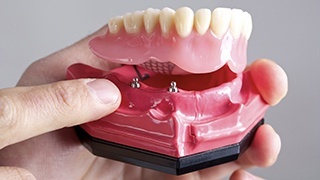 With implant-retained dentures, we can put an instant stop to that. Multiple implants can be fitted with attachments that a full or partial denture can snap onto, and because it will be anchored to your jawbone just like your natural teeth, it’ll have the same level of stability as well. Also because of this, the dentures will maintain their fit for much longer and you’ll even have a stronger bite force, enabling you to eat a wider variety of healthy foods with ease. Missing teeth don’t have to be a life sentence anymore-- nor do uncomfortable dentures. If you’re ready to get your complete smile back, dental implants are the way to do it. To find out if they are right for you, call us today to schedule a consultation.